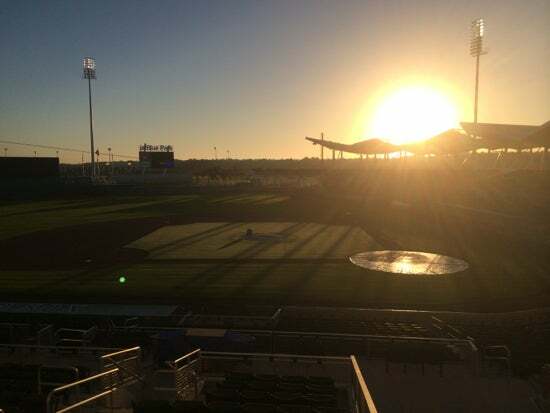 FORT MYERS, Fla. — The Red Sox will conduct their first full-squad workout today. It will be preceded by a series of speeches from assorted team officials. It’s one of those days that seems like more than it really is. The idea of the manager giving a fiery talk and motivating the players to go out and win sounds great. But the first game of the season isn’t until March 31. Today is more about reminding the players that they’re here for a purpose and to take care of business. Most managers, John Farrell included, do their best communication in smaller groups. But today makes for good theater. The biggest deal at this point is the starting pitchers are healthy (outside of a little hiccup for Jake Peavy) and into their routine. Now that the position players will be in drills, we’ll get a much better idea about guys like Xander Bogaerts, Grady Sizemore, Will Middlebrooks and others. David Ortiz downplayed the idea of his contract being a distraction. Dan Shaughnessy writes that nobody hates David Ortiz contrary to what he might think. Red Sox (and Globe) owner John Henry discusses the state of Fenway Park and other matters. Nick Cafardo has the story. The notebook has the Red Sox wanting to set a tone before the first full-squad workout. Here’s our daily report from training camp.